For trouble-free storage and retrieval of inactive files that need to be retained for future reference or tax purposes. The heavy-gauge steel frame easily locks together without tools. Warp-free particle board shelves (sold separately as model #5261) provide maximum strength to support heavy loads and supports up to 900 lbs. per shelf. 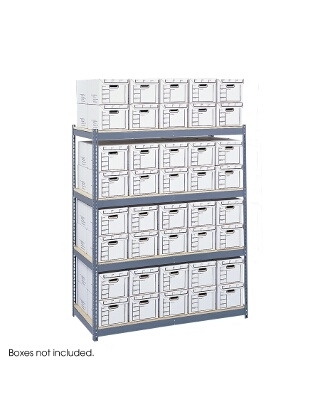 Designed to hold up to eighty 12"W x 15"D x 10"H letter/legal archival storage boxes. Storage boxes are not included. 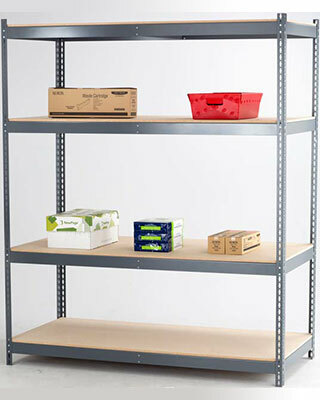 Particleboard Shelves are sold and shipped separately as model# 5261.